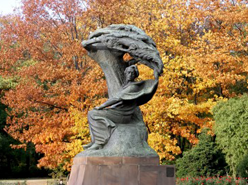 The image below is of the Fryderyk Chopin monument in Lazienki Park (Royal Baths Park) in Warsaw, Poland. The image below is of a “busker”, which is a person who plays music in a public place for donations. 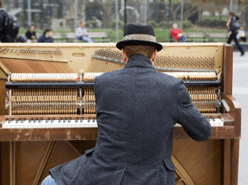 In 2015, the city of Los Angeles set up dozens of pianos for the public to use. They celebrated the start of the program with dozens of pianists playing all at same hour at locations around the city. Local piano tuners took part by contributing our services for the preparation of the instruments. 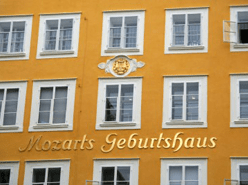 The image below is of Mozart’s birthplace in Salzburg, Austria. You can take a video tour, including images of his hand-written music at http://www.mozarteum.at/en/museums/mozarts-birthplace.html.